As you may remember from photos of our new place, one of the kitchen’s defining design details is it’s open shelving. I love the industrial brackets paired with the warmth of the wood shelves. I don’t want to clutter up that beauty with the contents of my pantry. I’m not a person who cooks out of the cupboard anyhow, but of course, some of the staples must be kept on hand. 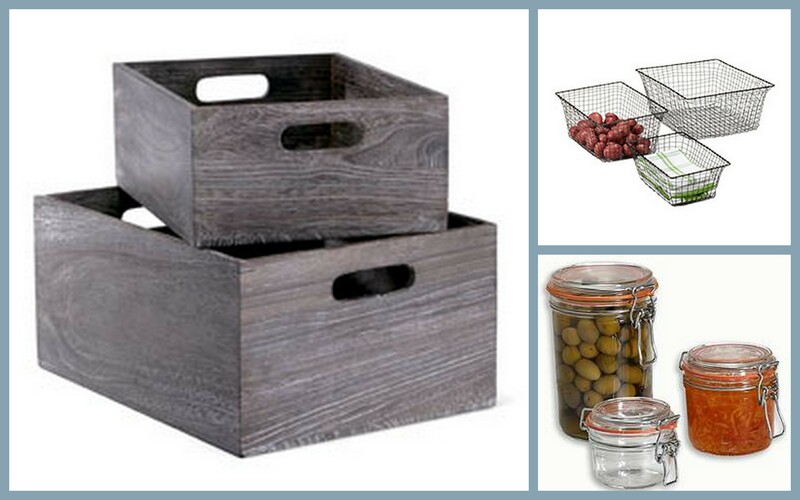 I’m searching for storage vessels and baskets that will compliment the decor, not create visual chaos. 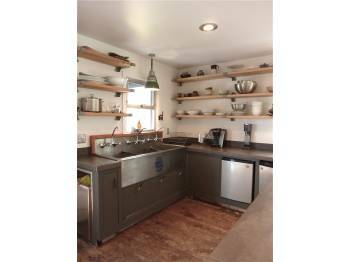 Open shelves in the kitchen, begging not to become cluttered. Good looking storage is not hard to come by. All of the items above were found on the Container Store’s website. I could use the wooden bins for boxed things and spices, the wire baskets for produce and table linens and the glass canisters for Thomas’s finger foods. I thought I might try to mix in some artwork as well, as long as it doesn’t look too full. I don’t want to load the shelves up to the max just because they are there! I’m still on the prowl for the perfect utensil container and coffee canister. Of course, I am not going to purchase anything before we move. I really don’t need to have one more thing to pack! We have pretty much all open storage as well, and the key to taming the cluttery beast was lots of items that are cobalt blue (most of our dishes and glassware, serving dishes, spice jars, storage containers). This created an effect of unity, despite actually having a ton of different items/styles/etc. — but it still has a “real” look. That is such a good tip Marta. Keeping all of your items to a similar color does help bring unity. My pallete will be mostly black, gray, white and natural and metal materials. Cool Dad! I will measure after we move in!